With the passage of California's plastic bag ban last month I've been seeing several reports stating that California was the first state to pass a plastic bag ban. Now as you know, Hawaii's plastic bag ban was completed in July 2015. So how are all these people getting it wrong? First, California was the first state to pass a statewide ban on plastic bags. It was passed back in 2014 with an anticipated start July 1, 2015. However it was put on hold and was sent back to voters this past November. Remember Propositions 65 and 67? Well Prop 67 passed so a state wide ban went into effect. Many people didn't realize that it went into effect the day after the election so stores started initiating the 10 cent fee. I mean, why wouldn't they!?! Prop 65 failed so all money raised from the bag fee goes to the store (unlike Washington, DC's bag fee). So where does that place Hawaii? 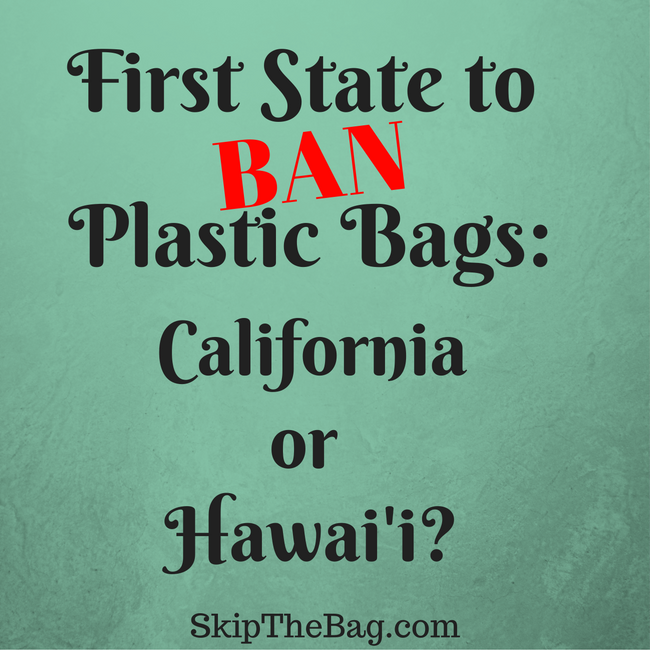 Well as of July 1, 2015 plastic bags were banned in 4 of the 5 counties in Hawaii, an essentially de facto statewide ban. They were first banned in Maui and Kauai Counties in January 2011 and then banned in Hawaii County (the Big Island) in January 2013. Finally Honolulu County (Oahu) brought up the rear with their ban beginning July 2015. Kalawao County, which covers a small portion of the island of Molokai and has a population of less than 100, has not officially passed a plastic bag ban. Furthermore there has not been one cohesive legislation passed at the state level banning the bags. So, on a technicality, I guess I've been wrong, and will allow California to claim the prize of having the first statewide ban on plastic bags. Do you live somewhere that has a ban bag or is it illegal like in Florida? Or does it not matter because you #skipthebag anyway? France is a leader in so many sustainable practices by banning so many disposable things. I should do some more research to learn what all they've done! Thanks for sharing.